Plant cells communicate with one another to coordinate the orientation of their cytoskeleton and direction of transport of the hormone auxin. This coordination underlies the periodic positioning of leaves and the coordinated growth patterns of the cells that together form each leaf. 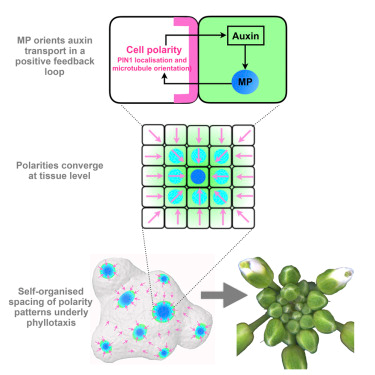 This project aims to better understand the signals that coordinate cell polarity by identifying genes downstream of auxin that are involved in intercellular polarity signaling. For more background see our paper or a commentary on it here. In plants, placing one tissue type next to another is sufficient to provoke the formation of a leaf along the boundary between them. How does this work? This project aims to better understand what happens when cell types are juxtaposed and how this leads to leaf formation. How do the two different types of cells talk to each other? What actually happens at the boundary? For more background info see our recent preprint.